Like most people who don’t smoke cigarettes, I don’t especially like the smell of cigarette smoke. I find it hard to breathe when I am around it and hard to stop smelling it when I finally move away from someone who was smoking. Living on campus for the past two weeks has proved to me one thing—LOTS of people smoke on campus, something I wasn’t expecting. What I really wasn’t expecting, though, was smelling it in my dorm room. My room overlooks a loading dock, and while the loading dock technically isn’t a designated smoking area, students utilize it that way. I’m counting down the days until it will be cool enough to keep my window closed and the smell of smoke out, but until then I’ll been concerned about how much secondhand smoke I would actually have to inhale before it caused me any damage. According to the CDC, second hand smoke is the smoke from a cigarette mixed with the smoke that smokers breathe out. Most people (me included, until now) think that it might not actually cause a problem, but it’s only problematic because of the smell. According to the American Cancer Society, though, smokers and secondhand smokers are inhaling the same chemicals. The most popular places for adults to acquire second hand smoke is at work and in public areas, making Penn State the perfect environment for it. 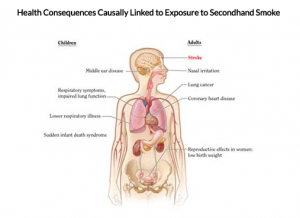 When secondhand smokers breathe in smoke, they inhale nicotine and other various toxic chemicals like smokers do. The CDC says that second hand smoke contains more that 7,000 chemicals, 70 of which are cancer causing and can also cause asthma attacks, respiratory infections and ear infections, as well as more severe problems such as cardiovascular disease, lung cancer and SIDS (Sudden Infant Death Syndrome). The American Cancer Society says that there are also some cases of secondhand smoke being linked to the throat and voice box, among other illnesses. 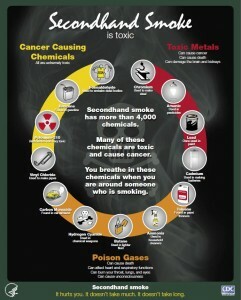 According to BeTobaccoFree.gov, secondhand smoke has killed approximately 3,000 adults each year because of lung cancer. Second hand smoke can also increase the changes by 20 to 30% of a non smoker getting lung cancer. It should be noted that the cancer causing chemicals in secondhand smoke is only caused by direct smoke, meaning that any lingering smoke or smell does not have chemicals in it and can therefore not be harmful, according to recent studies by the American Cancer Society. Residual tobacco smoke, or thirdhand smoke, though, could be a larger problem. 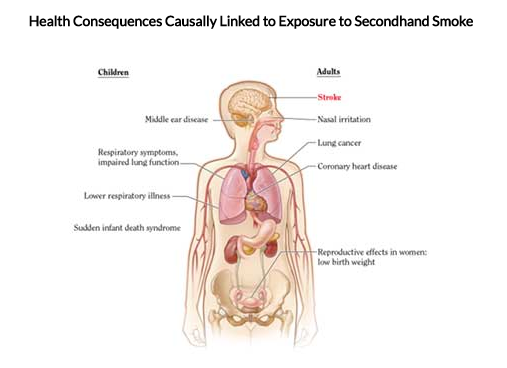 Thirdhand smoke refers to the smoke particles that settle into dust on surfaces and, when combined with gases, in the air, create chemicals that can cause cancer, according to the American Cancer Society. Although it hasn’t been proven yet to actually cause cancer, it can be very harmful for children and babies. So what can be done about it? Of course, the only thing that can be done to completely eradicate it would be to ban smoking, which won’t happen. There are some immediate fixes, though. According to Live Smoke Free, there are tons of short-term solutions that can be done to stop the spread of smoke. They suggest padding and sealing electrical outlets, light switches and baseboards because smoke can travel through small openings. There are also strips which can be put around windows and doors to keep the smoke out. One of the most important things, and one of the solutions that actually works in my opinion, is to run a fan or an air purifier. An air purifier takes the dust and particles from the air, which could have remnants of cancerous causing chemicals. Although it’s hard to change the environment around us, being informed about how it affects our health is very important. Learning how to deal with secondhand smoke and stop the spread of it is one of the only ways to keep ourselves healthy against it. This entry was posted in Uncategorized on September 1, 2016 by Lauren Hile. Like most, i agree with what you’re saying. I always hated when I went to the park or walked around campus to get some fresh air and then there’s a bunch of people smoking. Further defeating the purpose of getting fresh air. I’m sure everyone has experienced walking to class and getting stuck behind someone who is not only smoking but rather than inhaling, they’re just blowing all of the smoke out. So one, why are they even smoking and two, why are they blowing it back into the air. I don’t know where in the process this is but on the bright side, Penn State is working on an initiative to prohibit smoking on campus completely. I agree with you completely. I absolutely HATE the smell of smoke and can not stand to be around it. I was here at University Park this past summer and every day when I walked outside of my building there was always a person smoking, even at 8 in the morning. How could someone continue to smoke when there are facts that it kills. My grandfather right now has stage 4 lung cancer for the second time and is holding up, but there is no cure, therefore we really are not doing much. Back when he was a kid it was normal to smoke, everyone did it and their generation did not know the effects so it was okay. However, now our world is educated and should know better than to keep doing something that could eventually kill you. If I could show every person that smokes the condition my grandfather is in, I would hope that it changes their habits because it is awful. People should take care of the body they were given because you only have one. I find myself excited at the smell of smoke, especially cigars that my friends are always using as a reason to get together. Don’t get me wrong, I am by no means a smoker nor do I have any wish to begin. However, the smell is so nostalgic and brings back so many good memories of my grandmother’s house before she passed. I have learned that smells and memories are very much so connected. The path that smells take, and the nerve that they pass along just so happens to swing passed a big part of your brain in charge of your memory. I do not wish to condone smoking at all, and neither is it my intention to encourage a new second hand smoking addiction. I do find it funny that something so bad for you could seem so comforting at the same time. Perhaps that’s why people get addicted, they find comfort in their newly found habit. Check out how smells and memories are connected!!!! I completely agree with your statement here about second hand smoke, and it is more of a killer than people like to think! Back on my old campus (I transferred to University Park this year), I helped push for a health initiative for a completely smoke-free campus which was thankfully passed and is currently being implemented as of earlier this week (August 29th to be exact, and can be found here if you are curious as to how it works – https://studentportal.luzerne.edu/forms/Tobacco-Free-Policy.pdf). I hope to one day maybe even start turning the gears for a limited or even tobacco-free campus here at University Park as well. Perhaps one day people will realize the correlations between tobacco use and the harmful effects it not only has on themselves, but the people around them as well. Until then though, just remember to hold your breath and walk fast past those dreaded smokers! Best of luck in the class, and great blog post! I feel the same way as you do, and when ever I see people smoking, I’ll held my breath and walk the faster as I could. I still remember I did researches on Geography case studies when I was back in high school. Once I read the part in your blog which said that “secondhand smoke has killed approximately 3,000 adults each year because of lung cancer, and “living with a smoker increases a non smoker’s chances of developing lung cancer by 20 to 30%.” I remembered that the data I found on the case study which said that there are over 350 million smokers in China and 70% of the smokers on a week kills 7000 second hand smoking. I find it crazy! I knew second hand smoke isn’t good at all, but I never thought it would be this severe. Thank you for sharing this blog. The datas were just crazy. Being on campus for my third year now, I guess I’ve become used to the secondhand smoke around me. I used to be a social smoker, doing it at parties and social gatherings, but have since stopped to stay in better shape. That being said, the smell of cigarettes don’t really bother me like it may you or Hannah. However, I do find it inconsiderate to be smoking next to people who may not like it, and you probably should ask before you smoke around others. It may be your right to do so, but don’t impede on others’ comfort for your own habits. I think this video would help with your blog. (Link to video).